Extreame Savings Item! 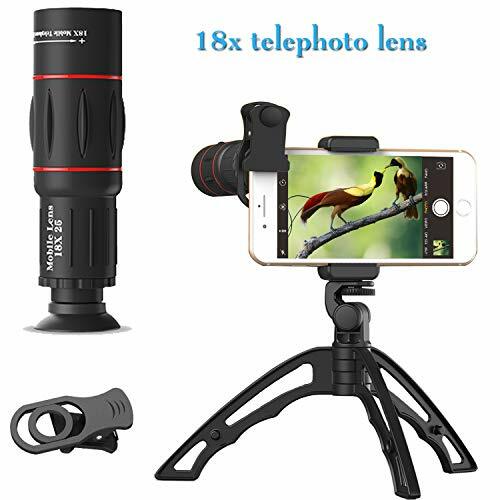 Save 41% on the Cell Phone Camera Lens Kit, 18X telephoto Zoom lens Clip On Attachment With Stable Multipurpose Tripod For Iphone 7 8 X 6 S Samsung S8, S9 Most Android Cell Phone by Evil Eye at DJ Luu. Hurry! Limited time offer. Offer valid only while supplies last. 18X Telephoto Zoom Lens: high quality & multi-layer coating glass helps the lens to get a clear photo from a far distance. Non-slip rubber adjust wheel makes you easy to focus without delay. Clip on & Extra Tighten Screw: Old version clip may slip due to the weakness. However, Strong clip with extra tighten mechanism can avoid slipping to the utmost extent. Stable Multipurpose Tripod: Inspired by spaceship landing shelf, the unique sturdy tripod has a more stable design than any other tripod, non-slip rubber underneath increase the extra reliability. 100% Customer Satisfactory: we will consistently to obey the customer-centric guidelines & offer high quality customer service. We love our products and we are happy to solve any question you come across with the lens kit. If you have any questions about this product by Evil Eye, contact us by completing and submitting the form below. If you are looking for a specif part number, please include it with your message.